About the only way to define Material Worlds is to say that it is about consumption and consumerism. I walked around for about two years looking for different ways to reflect the feeding frenzy I see in the western world today. I considered street shots of shopping bags moving past homeless people holding signs along a sidewalk. Then I considered capturing the glitz and glamour of products in store windows, contrasted by the blank, emotionless looks of the masses of people that passed them by, stopping long enough to drool over the objects of their desires. But nothing managed to really say what I saw day after day as I walked the streets. 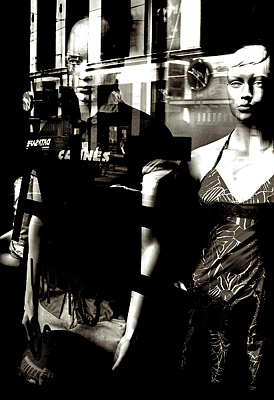 Then one day, by accident, as it always seems to happen, I noticed the mannequins in the store windows. Trapped in their glass cages, looking depressed and lonely, they spend their lives shackled by labels and enslaved by the whims of their owners. Welcome to the life of material worlds. Click here to enter the Material Worlds Gallery.